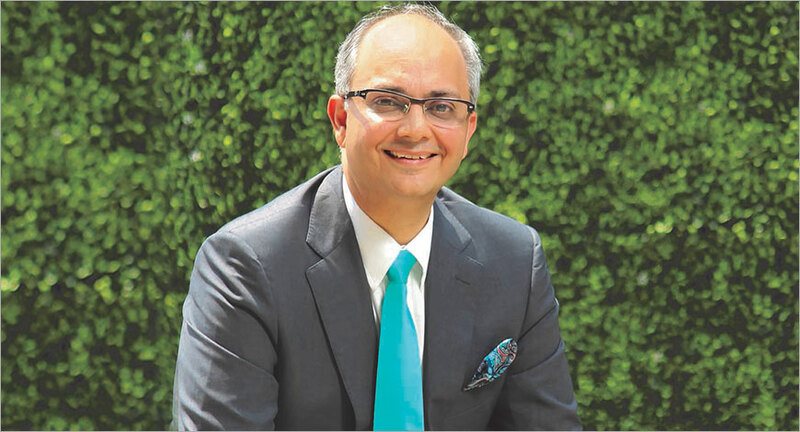 Punit Misra, Chief Executive Officer of the Domestic Broadcast Business of Zee Entertainment Enterprises Limited, is upbeat about two things – one, high growth in viewership (non-sport and non-news) that the network has achieved, with consistent numbers since April 2017, and two, that he has been able to infuse a process-driven culture in the working of the organisation since taking over the role in October 2016. Today, what enthuses him most is the numbers achieved by the network comprising 37 channels in nine languages. “Our topline has always grown ahead of the market. Also, our bottomline has grown ahead of our topline. The good thing is, some of that growth has accelerated and at 19.1% viewership share, we have hit the No. 1 network position, and that is hugely satisfying. This is viewership share, 2+, all India, Urban+Rural, since April last year. So, we are not talking one week, one market, one socio-economic class, Urban or Rural. We are talking the pristine, full number. That’s incredible,” says Misra. From seasoned marketer at an FMCG major to CEO of the domestic broadcast business of ZEEL - what are the learnings that have worked for you over the last two years? I did not know anything about the industry, and entered it with humility and a really huge appetite to learn. I still rate myself as a learner. My belief in brands, belief in consumers and the need to build that ability to get closer and closer to understanding consumers and customers, is something which has been of immense value. I have thoroughly enjoyed the ability to transfer some of those learnings into what we are trying to do here. Be it innovation process or capability building process, the aim was to institutionalise pockets of brilliance which already existed at ZEEL, into what I would call building repeatable models that are key to consistency of performance across markets. 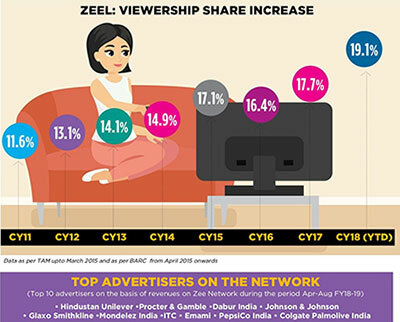 What is your own assessment of the overall domestic broadcast business of ZEEL? How do you rate its performance in terms of reach and revenue over the term that you have been at the helm? Let’s look at the organisation and its totality of existence, an organisation which is now in its 26th year of existence and a pioneer in the business of creating content which people love. Right from 2011, as a business we have been gaining viewership share. So, 11% viewership share is what we had in 2011. And as of last month, it is nearly 20% in the entertainment genre, which is non-sport and non-news. The second is the width of that leadership, because we have been gaining and leading market after market, be it the Tamil market where three years ago we were low single digit and are now near 20% share and growing, or Kannada where for eight weeks we are the No. 1 channel. As for Zee Bangla, where we were leaders several years ago, and lost that position maybe 8-9 years ago, we are now the No. 1 channel and growing share every month. We have further strengthened our position in Marathi and crossed 400 odd GRPs recently. Big Magic or Bhojpuri, is a business that we acquired, and we are growing there too, as well as in the FTA genre. The regional genre contributes 25% to 35% of the network’s total advertising pie. We are all set to launch a Malayalam channel, and evaluating opportunity for others. So, it’s a very broad-based, robust growth. What have been some of the big challenges that you faced? The first big challenge in any successful place is tackling the question ‘What’s the case for change?’ Why change, as the 11% viewership share of 2011 was already 16% in 2016. We needed to sit together as a leadership team and be clear about the case for change. That took its time, and we went through it in a pretty organised ‘Zee’ way. The second challenge for me was keeping the core entrepreneurial strength of the leadership team at heart, while talking of process and institutionalising things - somewhere they clashed. But we went ahead on that without a single leadership change, with the belief that here is a bunch of very successful leaders who know the trade, the business, the brand and the viewer. We have to make this change happen with those strengths intact. We brought in a few people as we created new jobs. And over a period of time, obviously some individuals do move, but 85% of the team if not 90%, is intact and getting better by the day. What is the uptake on the new brand philosophy ‘Extraordinary Together’? Has it had an impact in the short term? ‘Extraordinary Together’ has set us on a journey of a bit more of consumer connect, a bit more of marketing savviness, being built into our own DNA. We had set up the whole marketing function when our CMO Prathyusha Agarwal came in, and this was the first big exercise under her leadership. And from there, we moved to doing the same for our Zee TV master brand. We made it travel to some of our other brands like the Zee Tamil re-launch. Also brand re-launches that we did on &flix and &Prive, and then Zee Bollywood. It helped us in institutionalising some of these things so that they are starting to travel deeper and wider across the organisation. What is the CAGR that you would like to see in the next three to five years? We have gained 200 basis points on viewership share in the last two years. That averages 100 a year. We should continue with that and get better. On revenue, the numbers are in the public domain. Why should we not continue to grow at that rate continuously for the next 3 to 5 years? I see no reason why we should slow down. Looking ahead, what would be the three game-changers for the domestic broadcast business of ZEEL? I am a firm believer that ‘more is more’ - as more great content gets created, and gets served, we will see more consumption. I have seen that play out in all our regional markets. More quantum, better quality of content justified through more number of hours of consumption. The marketer or the content creator’s challenge is how to get more market-share. Then from a creative standpoint - how do you continuously create content brands that people will love? The third challenge is the challenge of talent. Getting new talent - be it writing talent, or acting talent, or young executive producers and group heads and so on… We have to be the place for the best business talent, the best marketing talent, the best creative minds.